George Cooper scores his debut goal for Posh against Oldham. Photo: Joe Dent/theposh.com. New signing George Cooper scored eight minutes into his Peterborough United debut in a 3-0 League One success over struggling Oldham at the ABAX Stadium today (January 20). It was a flattering result against a team who hadn’t won in their previous seven league matches. Posh scored twice in the last six minutes after Oldham had been reduced to 10 men following a red card for substitute defender George Edmundson. Posh forward Junior Morias in the thock of the battle against Oldham. Photo: Joe Dent/theposh.com. Junior Morias and Jack Marriott (penalty) also scored for Posh. Posh sprang something of a selection surprise by deploying Morias in a midfield position instead of Michael Doughty. It was a first League One start for Morias since injuring himself at Oldham in September. Recent signings Joe Ward and Cooper were left on the substitutes’ bench. It looked a positive move, but Posh looked unbalanced and lacked cohesion when attacking. As a result Oldham dominated midfield areas and should have reached the interval in front. Some promising passing was however ruined by some poor decision-making. Posh star Marcus Maddison in action against Oldham's Jack Byrne. Photo: Joe Dent/theposh.com..
Midfielder Mark Byrne danced through some weak challenges in the eighth minute, but inexplicably passed instead of shooting and Liam Shephard, who was cautioned in the first minute for a poor tackle, cleared. And Ben Pringle should have done better when intercepting Shephard’s wayward pass, but he was too slow in deciding to shoot and Ryan Tafazolli made a fine block. Pringle also glanced a header wide while Kean Bryan tested Jonathan Bond in the Posh goal with a fierce strike. Posh rarely managed to string a couple of passes together. Marcus Maddison spent more time on the floor than in possession, although his sliderule pass did send Jack Marriott through, a great chance ruined by poor control which enabled Oldham ‘keeper Johnny Placide the opportunity to come off his line and save. Posh striker Jack Marriott in control against Oldham. Photo: Joe Dent/theposh.com. Posh were otherwise restricted to long shots, most of which were poorly hit and badly directed. Oldham made a couple of bright movements at the start of the second half, but it was Posh who made the breakthrough in the 54th minute when Morias accepted Chris Forrester’s neat pass, turned his defender, and slotted into the corner of the net from 18 yards, possibly with the aid of a deflection. It was almost 2-0 a few minutes later when Edmundson made a hash of Maddison’s cross, but recovered well to block Marriott’s volley on the goalline. Forrester then saw a 35 yard strike tipped over the bar by Placide before Edmundson’s day got much worse. He was cautioned in the first half for a foul on Morias and then foolishly pulled Marriott back in the centre circle to pick up a second yellow card midway through the second half, at a time when Oldham had been bossing the game. But the visitors continued to press with 10 men and substitute Dan Gardner struck the base of a post from 20 yards. Morias converted a Maddison chip, but was well offside. It was Maddison’s last contribution before he was replaced by Cooper for his debut 15 minutes from time. And Posh took control in the later stages as Oldham tired. Cooper’s proud moment arrived on 84 minutes as he showed excellent control of a superb Forrester pass before finishing with style. 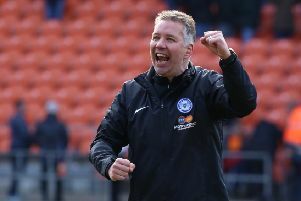 Posh claimed a third goal in the last minute when Marriott converted a penalty after he’d been tripped by Gardner, a decision contested so vehemently by Oldham, two more players found their way into the referee’s notebook. Posh: Jonathan Bond, Liam Shephard, Andrew Hughes, Steven Taylor, Ryan Tafazolli, Anthony Grant, Chris Forrester, Junior Morias (sub Idris Kanu, 83 mins), Danny Lloyd (sub Joe Ward, 60 mins), Marcus Maddison (sub George Cooper, 76 mins), Jack Marriott. Unused substitutes: Michael Doughty, Alex Penny, Jack Baldwin, Conor O’Malley. Oldham: Johnny Placide, Cameron Dummigan, Brian Wilson, Anthony Gerrard (sub George Edmundson, 25 mins), Tope Obadeyi (sub Aaron Holloway, 61 mins), Kean Bryan, Kundai Benyu (sub Dan Gardner, 60 mins), Ben Pringle, Jack Byrne, Ousmane Fane, Craig Davies. Unused substitutes: Zeus De La Paz, Mohammed Maouche, Courtney Duffus, Nepomuceno. Goals: Posh - Morias (54 mins), Cooper (84 mins), Marriott (pen, 90 mins). Sending off: Oldham - Edmundson (second cautionable offence, foul). Cautions: Posh - Shephard (foul), Morias (unsportsmanlike conduct), Tafazolli (foul). Oldham - Byrne (unsportsmanlike conduct), Edmundsun (foul), Bryan (dissent), Gardner (dissent).